Super Savings Item! Save 36% on the TGY Grinder Set of 2 Adjustable Coarseness Salt & Pepper Shakers Glass Mill Brushed by TGY at Mystic Oaks. MPN: unknown. Hurry! Limited time offer. Offer valid only while supplies last. Kitchen is the heart of the house. Any tools or gadgets can united a great experience of cooking and gatherings. And by details, we mean seasoning. Kitchen is the heart of the house. Any tools or gadgets can united a great experience of cooking and gatherings. And by details, we mean seasoning. Our amazing salt and pepper grinders can meet all your needs. It’s time to say goodbye to your old shakers. 1. 5 adjustable grinding levels -- Choose your spice and grind it to perfection. 2. Easy refilling without messes -- The wide opening never leaves a mess on your table or counter. 3. Easy to clean -- Just unscrew the bottom glass and hand wash the grinding mechanism. 4. Perfect for indoors and outdoors activity. 5. A covered lid can provides you fresh spices powder for your tasty meal, away from moisture and dust. Please don’t fill up your grinder. SIMPLICITY and ELEGANCE -- The brushed stainless steel top and the clear glass body made these shakers incomparably modern and smart.Our salt and pepper grinder will spice up your dining table . ADJUSTABLE FINENESS -- It can be adjusted for fine to coarse grind with 5 grinder settings.Just turned the black knob on the top. 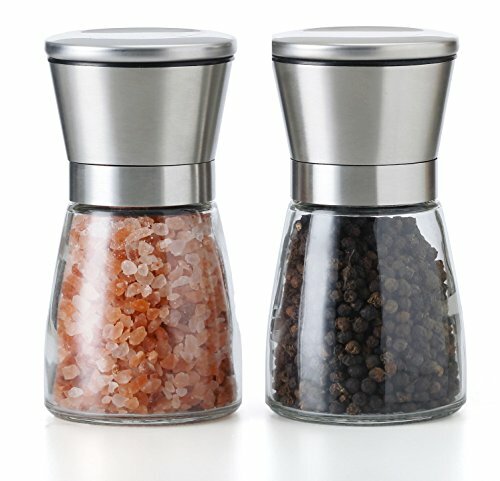 PREFECT FOR ALL SPICES --Even though the name is salt and pepper grinder, it not only for salt or pepper.You can fill them with any kind of spices.Choose what you like. EASY TO USE AND REFILL -- Clear body will tell you when you need to refill. The wide opening can make you fill them without any miss. PREFECT SEAL DESIGN -- Our salt and pepper grinder has a sealing lid. It can prevent moisture and water penetration. Keep your spices remain completely fresh, away from insect and dust. If you have any questions about this product by TGY, contact us by completing and submitting the form below. If you are looking for a specif part number, please include it with your message.